Hawaiʻi Island police are asking for the public’s help in identifying two suspects wanted in a theft investigation. In the early Wednesday morning (December 9), a 21-year-old man was working at his computer on the University of Hawaiʻi at Hilo campus. At approximately 4:40 a.m. the victim was approached by two suspects who stole his computer and backpack. The victim’s property was recovered before the suspects fled on foot. 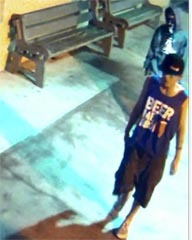 The first suspect was wearing a blue tank top, black shorts, light shoes and a dark baseball cap. The second suspect had a dark bandana covering his nose and mouth. He also was wearing a gray hooded sweatshirt, cargo shorts and dark footwear. Both suspects appear to be in their late teens or early twenties. Police ask anyone with information about this case to call Officer Malia Bohol at 961-2213 or the Police Department’s non-emergency line at 935-3311.